Realtime stabilization is one of the hottest features in 360 camera. It’s like having a built-in 3-axis gimbal. There are now a handful of 360 cameras with this feature. 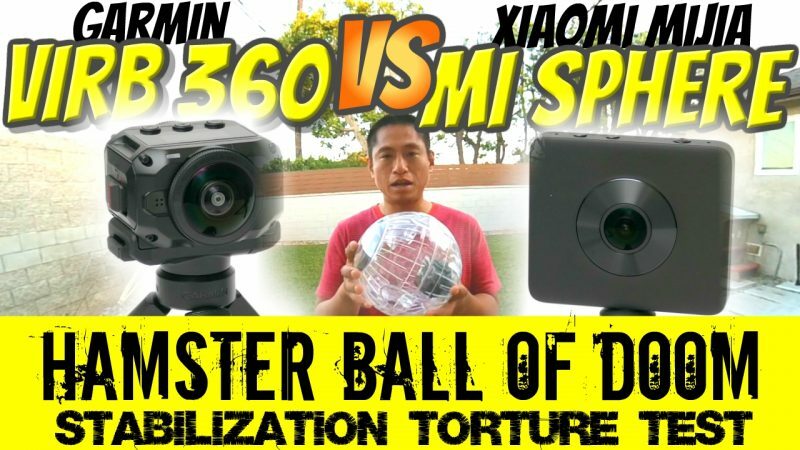 In this test, I compare the stabilization performance of two high resolution 360 cameras with stabilization: the Garmin Virb 360 and the Xiaomi Mijia Mi Sphere 360 camera. To test the stabilization between these cameras, I put both of them in a hamster ball (I got the hamster ball test idea from jcg8319). To summarize, both 360 cameras did well in this stabilization test. If you want the best stabilization for consumer 360 cameras, you can get the Garmin Virb 360 ($799). Besides being able to stabilize, the Virb 360 has the option of keeping the camera oriented toward the direction of movement, which is useful when the Virb 360 is used in a car or other vehicle (on the Xiaomi or other 360 cameras, the stabilization will always lock on to the same compass direction). Virb 360 can also put an overlay on the 360 video showing the speed, G-force, a map, and other statistics. – After around a couple of minutes, the video will still be stabilized but will begin to drift. This can be fixed in postprocessing (see here) but adds another step to the workflow (and requires Adobe Premiere Pro to correct it). – There is a subtle “heatwave” effect when the Xiaomi video is stabilized. This is most noticeable in static scenes. – The Xiaomi stabilization cannot be turned off except through a workaround (using an app version older than 1.6.4.12888). – If you start recording too soon after turning it on, the Xiaomi won’t have stabilization (actually, that’s the other way of turning off stabilization). Thanks for buying through these links to support 360 Rumors so I can do more tests and reviews! I always read your blog and bought the Mijia Camera using your link! I was wondering whether the Virb 360 has sensibly less heatwave effect compared to the Mijia, or not at all. I would use it mainly for drone shooting, in which the heatwave of the Mijia makes the videos almost unwatchable. Hi Emanuele! Thank you very much for reading 360 Rumors and buying the camera through my affiliate link. I really appreciate it! You can avoid the heatwave effect by disabling stabilization. One way to do that is to begin recording right away after powering it on. The other way is to render the video using app version 1.6.3. I then stabilize in post using Skybox. Re the Virb, I can’t see any heatwave effect. You can check out samples here: https://www.youtube.com/watch?v=kC3XtSOnt5Q&list=PLtGqGHDrZeFiNA0WynST2_SewogJIGFhW&index=1 You can see that in the hamster ball one, there is some heatwave effect on the Xiaomi, but not on the Virb 360. Hi yes the firmware already fixed the drift issue. When you say it wasn’t “really stable” it’s hard to say without seeing your video. Can you upload to youtube and post a link to the mi sphere facebook group? How long do you have to wait after the camera turns on to hit record for a stable video?